Note: Norris has now signed with the Padres. Hey, remember Bud Norris? The guy who was an opening day starter for the 2013 Astros (although that team lost 111 games, so that might not be something to brag about). He then was traded for prospect Josh Hader (who was just traded for Carlos Gomez), and a replacement level player in L.J. Hoes and a compensatory 1st round pick. The draft pick turned out to be Virginia’s Derek Fischer who has hit 19 dingers for the Astros single-A club in 2015. He won 19 of his first 35 starts with the Orioles. This O’s pitcher got released on August 8th after clearing waivers. He is now free to sign with any team willing to take on his services. Norris has been a huge disappointment in 2015 — actually huge disappointment would be an understatement. The Orioles signed Norris to a one-year, $8.8 million contract last winter to avoid an arbitration hearing. He was slated to solidify the middle/back end of the O’s rotation. A solid veteran who over his first five full years in the league averaged a WAR right around 2. He has never been flashy but always solid, until 2015. 2015 is the year of the Bud Norris Apocalypse. Norris sported an ERA of 7.06, and a Win-Loss record of 2-9. So is Norris this bad, or is he a victim of bad luck, and is picking him up for a pro-rated portion of the league minimum worth it? What changed in 2015 versus the rest of Norris’ career that saw him deliver an average ERA of 4.20 over parts of six seasons? There’s a few factors that snakebite Norris in 2015. The first is Norris had a brutal increase in his FB/HR rate. For his whole career (2015 included), 11.4% of the fly balls hit against Norris went over the wall. This year that number ballooned to 17.7%. That is over a 55% jump. Why the huge jump in FB/HR rate? Well, it is not that his fastball velocity dipped, in fact his fastball velocity is over .6 mph faster than his career average of 92.9 mph. Norris is throwing the same rate of strikes vs. his career rate (63%). He has not been throwing in the middle of the plate any more than usual either. In fact, on pitches in the middle third of the strike zone he has thrown 0.7% less pitches than his career average. Perhaps the reason behind the change in FB/HR rate is luck, but Norris is also throwing 7% more fastballs than the career average. Batters may have been sitting on his fastball more than usual and were teeing off. My thinking is that when a pitcher does not have a huge drop in velocity or major change in strikes thrown, the huge increase in FB/HR rate must be something of a fluke. Norris also got snakebitten by an awful LOB% of 59.5%. His career rate is 72%. Maybe this is just a product of being unlucky. But Norris has been miserable in situations with men on base; with runners in scoring position, batters were hitting .313. No pitcher on earth is going to have a good ERA when batters are hitting over .300 with RISP. To recap, it seems that Norris may have been much more unlucky this year than other years in his career. He has not been good by any means, but he is not as bad as the 7.06 ERA he has this season. The xFIP and SIERA projections give Bud an estimated ERA of 4.55 and 4.48 much closer to his career mark of 4.20. It seems that Norris has been plagued this season by an inability to pitch with RISP and an awful FB/HR rate. I highly doubt anyone is going to confuse Norris for a top-tier starter, but he should still be a serviceable back of the rotation option. Signing Bud Norris at this point in the season has practically no risk. If Norris signed for the league minimum, it would be pro-rated to roughly $150,000. Norris could serve as a $150,000 insurance policy in the event that a starting pitcher goes down. He could get picked up and put in the bullpen in a long-relief role with the capability of making a spot start. Having a viable long-relief man is huge during the late months of the season as teams try to save their bullpens. He could easily be picked up by a team like Minnesota who is 4 games back of the wild card. They could use back of the rotation help with the injury to Tommy Milone. The Giants could use rotation help with the recent injury to Mike Leake. And unless Kansas City feels comfortable running Jeremy Guthrie out to the mound every 5th day, Norris could be a good fit. Even a team like St. Louis or Tampa could use him for a spot start to give some rest to fairly young starting rotation. There could potentially be multiple landing spots for Bud. While Norris is not a flashy option by any means, he is a veteran who could easily be a band-aid for a team with a banged up rotation or just simply looking for someone to eat innings. *Stats acquired from FanGraphs.com and Baseball-Reference.com. Long ago, the baseball deities descended upon our humble planet and created this wonderful game that we call baseball. When they did this, they created the strikeout. Striking out is arguably the most unproductive out in the game. Like many things, not all strikeouts are created equal. If a batter has a three-pitch strikeout, it is considered a miserable and wasted at-bat. But if a batter has an eight-pitch at-bat that was grinded out to a full count and then strikes out, it is consider a much better at-bat. The batter forced the pitcher to work harder and throw more pitches, even though the end result was a strikeout. It would also make sense that an eight-pitch strikeout would give the hitter a much better understanding of the pitcher’s “stuff” and this could enhance his ability to hit the same pitcher in the next at-bat or down the road in a future game. In baseball stats, strikeouts are generally lumped into total strikeouts and K%. This brings the question of does it make more sense to lump all strikeouts together, or does it make more sense to look at them through the filter of when they occur in terms of the count? The purpose of my analysis today is to decipher if there is any kind of correlation between a player’s offensive production and the percentage of his strikeouts that occur early in an at-bat (0-2 or 1-2 counts) in the 2014 season. My theory is that as a hitter’s early at-bat strikeout % increases, his offensive production will decrease. For my data points, I took the top 50 hitters in the 2014 season in terms of wRC+ and then calculated the number of strikeouts the each player had in either 0-2 or 1-2 counts (Early At Bat Strikeouts or EABK) and divided this number by the player’s plate appearances to create the EABK%. I then took the data points and looked for correlations in the basic slash line stats: Average/On Base Percentage/Slugging Percentage. I also looked for correlation in more advanced metrics like wRC+, wOBA, and OFF, which give a better overview of a player’s overall production. The first set of statistics I looked at were the basic stat line statistics and how they correlate to EABK%. The strongest correlation of the three was between batting average and EABK%. With a .47 correlation (1 being a perfect correlation), 22% of the data points fit the trend line which itself had a -.5 slope. 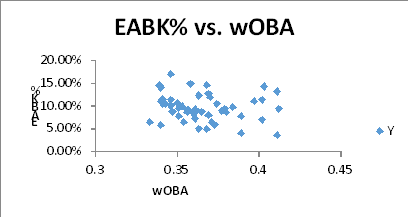 So in terms of batting average, there was a strong inverse correlation to EABK%. As EABK% goes up, average tends to decrease. The highest average was Jose Altuve who had a microscopic EABK% of 4.95%. There was only one .300 hitter in this group with an EABK% over 10% (Jose Abreu). OBP had a similar, but not as strong, correlation. With a correlation of .38 and a trend line slope of -.46, it was clear that as EABK% increased, OBP decreased. SLG% saw virtually no correlation at all. I believe there was such a little correlation in this category because slugging percentage is strongly influenced by the number of total bases a player earns with each hit. Players like Mike Trout an Giancarlo Stanton have a large number of their hits go for extra bases and also have EABK% of the higher end of the spectrum (EABK% of 11% and 14%). Since they have a large number of XBH, this neutralized the negative effect of the early at bat strikeouts on their slugging percentage. 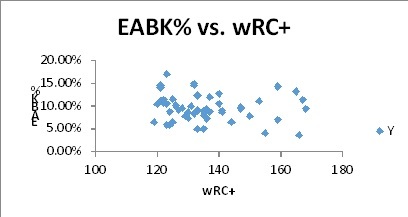 The most interesting correlation, or non-correlation, I found was that there was no correlation between EABK% and BB% (walk percentage). I would have thought there would be a clear downward trend in BB% as EABK% went up. If a hitter strikes out early, he never had the chance to walk, in contrast a hitter who work a deep count consistently is more likely to walk since it is much easier to walk deeper in counts. This none correlation could just be a product of the small sample size of only fifty players, a larger study could yield different results. Nonetheless, I thought it was interesting because if a batter strikes out out early in an at-bat, it would limit the chances he draws a walk. It appears that the trend did not support this thought process. To recap my analysis, let’s go back to the beginning. My original hypothesis was that for the 2014 season, the top 50 batters, as determined by wRC+, would have a drop in overall offensive production as the Early At Bat Strikeout % rose. Initially, by looking at basic slash line stats of batting average, On Base percentage, and Slugging %, I did see a correlation between a rise in EABK% and a drop in average and OB%, but slugging % did not show a correlation. When looking at overall offensive metrics, the correlation was not strong at all. I believe that since these metrics are based more on how many runs the player creates and incorporate different values for the type of hit contributes to the lack of correlation between EABK% and more advance offensive metrics. I do think EABK% could be a useful stat for analyzing players who are more valuable by getting on base. For example, comparing leadoff batters’ EABK% would be useful because it could help explain which leadoff hitters are more adept to work counts and the impact on the offensive production of a lineup as a whole. Coming back to my original hypothesis, it was proved wrong by the data from the 2014 season. Perhaps looking at multiple seasons, with a larger sample size would provide a different conclusion. But using the 2014 season as a snapshot, there was not a strong correlation between offensive production and EABK%.